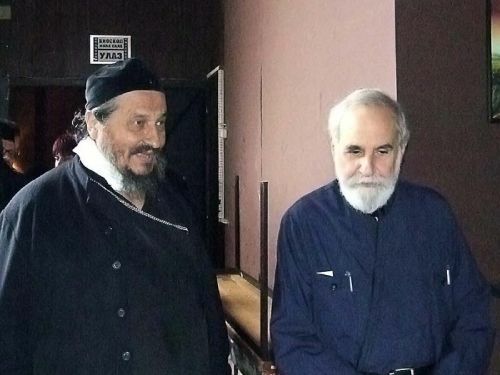 The following is translated from a talk given by His Grace, Atanasije (Jevtic), Retired Bishop of Zahumlje and Herzegovina (Serbian Orthodox Church), at the Sretensky Seminary in Moscow on November 1, 2001. 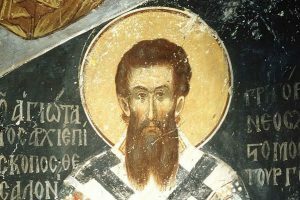 Today we will be speaking about St. Gregory Palamas and the essence of hesychasm. The Council of Constantinople in 1351, which took place 650 years ago, clearly and definitively affirmed the experience and theology of hesychasm. The first such council had met ten years earlier, in 1341, at which Palamas and his Athonite monks presented the Hagioritic Tome, in which they set forth the essence of their experience and of their theological confession against Barlaam. Later, in 1347, another Council met, this time against Akindynos; by then Barlaam had already left and become a cardinal, a bishop of the Pope, after which he took up the fight against hesychast theology. Hesychasm is a prayerful life, a life with love; at the same time, it is a mystagogical and liturgical life in which, following one’s purification from the passions, one attains a profound experience and taste: the vision of the glory and grace of God. It is not simply a means of preparation for prayer, as Barlaam had initially thought and even certain ignorant monks had explained, in which one must press one’s head to the chest, follow one’s breathing, and gaze at one’s navel. That is nonsense, and St. Palamas criticized it. Of course, it is essentially to become focused, but this is not meditation. It is not meditation, but a deepening in prayer, so that the mind would descend into the heart, which is the depth of man’s being. As the Savior said: For out of the heart proceed evil thoughts (Matthew 15:19). Or take another organ, such as the stomach. It also has a profound influence on one’s nervous and psychological life. Again I say: “We knew this, too.” When one is in extreme grief it can happen (and it happened to me once) that a strong desire to vomit arises; the stomach convulses. That is, there is a strong link between physical and nervous life. The heart is the whole of a person. A man shall draw nigh, and the heart is deep (Psalm 63:7, LXX), says the psalm so briefly and concisely. Therefore, if one prays only in one’s mind, this prayer will be superficial, despite the fact that the mind is a profound organ of the human person, of his soul. But only when the mind is united with the heart can it function properly. Such is the connection of the organs, of the psychophysical constitution of the human person. This is how Palamas and the hesychast Fathers spoke about this. There is a homily on prayer attributed to St. Symeon the New Theologian that does not in fact belong to him. There it speaks of attention (prosochi) and prayer (prosefchi). Efchi means supplication or prayer, and pros- means to approach, as for instance in “to step” [stupit’] and “to step up to” [pristupit’]. It is the same with prosefchi. And prosochi also has the meaning of being close to something, of attention to something or someone, of being close to him. The attentive person can do much more for himself and within himself: first of all, he can draw God’s attention, God’s love, God’s grace. St. Symeon the New Theologian says that one must struggle, pray, weep, repent, and undertake ascetic labors – but all the while recognizing that it is not ascetic struggles that save us, but attention, God’s eyes, which see us in this spiritual disposition and condition. It is He, the Lord, Who saves us. Through one’s ascetic struggles one simply demonstrates that one desires salvation and that one is disposing oneself to it, that is, that one is attentive to it. In the Old Testament more importance is attributed to the sense of hearing. The ancient Greeks always emphasized the sense of sight: everything is marvelous; everywhere there is beauty, kosmos [ornament, order]. There is a good series of books about this by Losev: History of Classical Aesthetics. All Greek philosophy comes down to aesthetics. Florovsky writes that this was likewise the case in nineteenth-century Russian philosophy, even for Soloviev. Such is the temptation of aesthetics, that everything must be beautiful. Incidentally, according to Gregory the Sinaite – and Symeon the New Theologian spoke of this earlier – the Fall of man consisted of his dispersion: his senses, thoughts, will, desires – each pulls the body in its own direction. Grace is like a good coordinator. Thus, in some governments there are the ministers of such-and-such and such-and-such, and then there is the minister of coordination, of communication, who links them all together. The grace of the Holy Spirit unites us, making us into one person. And indeed, when someone senses and receives God’s gift, then within himself he immediately becomes one, unified. This is what hesychasm affirms. The purpose, or fullness, is the manifestation of the grace of God: that one would with all one’s being not only feel, but taste and even see it. The hesychasts said that they saw the same light as the Apostles on Tabor; they said that this light is Divine; that this light is Divine energy, which can be distinguished but not separated from the Godhead. Therefore, when Divine grace comes, God comes – but He is present in His energy, and not in His essence. And, of course, His presence is personal, because essence is always the essence of someone, and essential energy is likewise the energy of someone – it is the activity of his nature, of his essence. In this Palamas already confessed the fullness of triadological theology. Barlaam, as a philosopher following Aristotle, rejected this, saying that such categories cannot be distinguished in God, because God’s being is simple (aplotis) and without complexity, and this introduces complexity. Palamas responded very cleverly: could it really be that God’s Essence and His Hypostases are the same? We believe in three Hypostases and one Essence. Does this in fact divide God? Does this make God complex? No, God remains simple. Thus, if we confess God to be tri-hypostatic and almighty (pantodynamos) – that is, if He has might, energy, and power – we thereby do not create any complexity in Him. As such, Palamas spoke in the language of theological confession, and not of philosophy. Faith gives meaning to words! The Cappadocian Fathers said the same thing: faith gives meaning to words. There is a good article by Lossky about this, not in The Mystical Theology, but somewhere he has something on faith as the principle of consciousness. Barlaam rejected any distinction – and, even more so – any division in God, asserting only eternal simplicity. According to him, the saints there [in heaven] will only partake of God’s essence, while here they will see only created light and grace as a created gift, as habitus (habit). This means that God, as it were, creates little packages or boxes – just as during our Serbian catastrophe the Americans send us humanitarian aid: first bombs, and then packages. So God, too, supposedly gives out these little packages, to each in his own way – but it is already clear that these packages or gifts have nothing to do with God! By their very nature and content all this is external, alien, created. The result is that we do not have communion with God. Or here is another example: think of a young spouse, a bride, who is taken home, but her husband does not see her, does not love her, does not live with her – but every day gives her little packages or gifts. She would go out of her mind! Think of Dostoevsky’s novella, “The Meek One,” one of his most beautiful pieces. I even wrote an article about it. The heroine could not stand this “prince” who had married her: he loved himself most of all, and she could not tolerate this contempt and humiliation. We are arriving at the most important point. What is salvation? It is union with God of the closest and most intimate kind, just as Christ united more than closely with the seed of Abraham: He also Himself likewise partook [paraplisios] of the same (Hebrews 2:14). Plisios is “near,” and plision is “neighbor.” But paraplisios is even better, even more than simply a close partaking in body and blood. We attain the closest participation when we receive Communion. In the prayers it says: “Christ! O Wisdom, Word and Power of God! Grant that we may more perfectly partake of Thee.”  “More perfectly” means more truly, deeper, more participatively. This, too, is what paraplisios means. Thus, we unite with God. But what kind of union is this? According to essence? Then we would disappear; it would be pantheism and we would cease to exist. God is that mighty in His essence. It would be as if we threw a small crumb of bread into the fire or a drop of water into the ocean. What will happen to them there? Therefore it is not a union according to essence. Hypostatic union in our nature takes place only in the Person of Christ. We unite only with the energy of God, thanks to Christ’s hypostatic union: He came to us and became the mediator (mesitis). “Intercessor” [khodatai] is not entirely exact, because an intercessor goes between two people, as I understand this word. “Mediator” [posrednik] is also an “intermediary” between two people. But the Fathers (for example, Nicholas Cabasilas at the time of St. Palamas) say that it is as if a third person took two people and united them with himself and they became linked, becoming one. This is how Christ, as Mediator, united God and man in one. We were always told about Marx’s theory that capital is the mediator between the means of production (natural resources, etc.) and labor. Marx was a Protestant, coming from a Protestant environment, and understood mediation in that way. Protestantism has the following understanding of a mediator: God sent an ambassador to us to sign a contract between God and us. 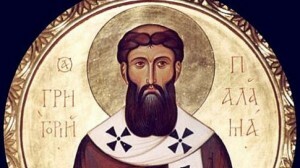 No, this is not the Incarnation of which St. Athanasius spoke, and Irenaeus even before him, and which Palamas repeated. Christ destroyed the wall of partition and God became man – the God-Man. This means that, thanks to Christ’s hypostatic inhumanization, we can partake of Divine energy, which is the content of Divine life. Every being and creature has energy. Even a stone has the energy of gravity and force: a large stone placed on your foot will press on it. This is the energy of gravity. Every being is qualified, that is, is characterized by qualitative characteristics; if these qualities are removed, then nothing will remain – it will be a fictional entity. In this sense, energy is capacity; essence is manifest with the help of its activity. Such is the ontology of Divine energy. Therefore, we can partake of Divine life, of the life in which God lives. The Divine state – this perichoresis [mutual indwelling] among the Father, Son, and Holy Spirit – is joy, love, light, and blessedness. This is what we partake of, which means that we partake of the Godhead. At one point Palamas said somewhat incautiously, as had the Areopagite, that God’s essence is “beyond” being (yperekeina) or even “supra-divine” (ypertheos). Then one could have said that the energy is, as it were, the “further” or “underlying” (yfeimeni) part of the Godhead (“overlying” is yperkeimeni). Later, when it was pointed out to him that he was dividing the Godhead, he abandoned the distinction of this “further part.” All this is a single active Godhead, and the energy is the uncreated, eternal Divine power. If Palamas were alive today, modern physics would suit him very well. He thereby affirmed the reality of salvation and the reality of communion. But all the Western scholastics taught what Palamas called “created grace” (gratia creata). Peculiar icons began appearing at the time of the scholastics: you see that the saints are terribly fat and have a sort of circle, like a hoop, over their heads; it is a halo, but it has no connection with the saint – it hangs by itself. The Orthodox, however, do not even need to paint a halo: the entire background of icons or frescoes is already golden. They shine, and the gold is everywhere. His Grace is likely referring to The Ascetical and Theological Teaching of Gregory Palamas by Hieromonk (later Archbishop) Basil (Krivoshein) (1900-1985), published in Russian in Prague in 1936; an English version appeared in the journal Eastern Churches Quarterly, vol. III, 1938. George Ostrogorsky (1902-1976) published an article in Russian on the Athonite hesychasts and their opponents in Russian in 1931; he is well known to English-language readers as the author of History of the Byzantine State (first published in German in 1952, then in English in 1969). Aleksei Fedorovich Losev (1893-1988) was a prominent Russian philosopher, philologist, and culturologist. Several years after his death it was revealed that both he and his wife had been secretly tonsured to monasticism in 1929. The series of books mentioned by the author appeared in eight volumes between 1963 and 1988. One of his pivotal early works, The Dialectics of Myth, originally published in 1930, exists in English translation (New York, NY: Routledge, 2003). Cf. Epistle to the Philadelphians, 8. According to scholastic theology, created grace is a habitus (Latin) in the sense of being a received or perfecting quality. It should not be confused with the contemporary sense of “habit” as a settled tendency or practice.